Danny Kaye was a man of many talents. He had a remarkable mind for creating new ideas and accepting the unconventional. For years and years, he topped the men's best dressed list, but his feet always hurt. The day after he appeared in public wearing MURRAY SPACE SHOES, he was taken off the men's best dressed list. But his feet were comfortable and happy! He had discovered shoes to fit the shape of his feet. The untold part of the story is that he worked for years helping Mr. and Mrs. Murray create new, artistic designs embodying comfort. His favorite design was the self-adjustable Space Kinetic. This was the style of shoe he wore most often. The Space Kinetic began with the need for an almost barefoot-looking appearance for the Broadway performance of "Two By Two". Thereafter, the Space Kinetic became a part of his regular attire. 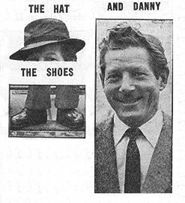 Danny Kaye thought shoes should be finely crafted pieces of art, as individual as the person who wore them. He was always involved in the design of each pair of shoes made for him. He was enthusiastic about the development of the MURRAY SPACE SHOES and gave many hours of assistance in its promotion. 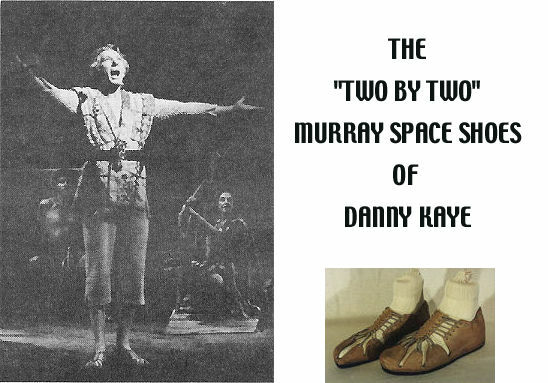 We, personally, made eight pairs of Danny Kaye's MURRAY SPACE SHOES after 1979 and he left us a nice collection dating from the 1950's to 1987. Custom molded shoes, custom molded boots and custom molded sandals for your feet by Murray Space Shoe.